Hello and I hope everyone had a nice Monday. Well, an okay Monday... or maybe, just a Monday. Ugh...Monday. With St. Patty's Day coming up, I thought I'd share a super easy DIY project that would be fun for a St. Patty's day celebration. To hear my general thoughts on St. Patrick's Day, check out my post from 2 years ago where I miserably failed at making Irish Soda Bread (damn you caraway seeds) and had to give it a re-do. It's a hoot, I must admit, and there is a great recipe for not-so-Irish Soda Bread that is awesome and has an utter lack of caraway seeds. Directions: Punch a hole on both sides of the shamrock and start stringing them along! Find a nice place to hang in your home, or over a dessert table if you're having a party, and BAM - you've got yourself a one of a kind garland that cost literally $5 and 5 minutes of your time. Plus you can do it while drinking green beer and watching traditional Irish movies like.... are there any traditional Irish movies? 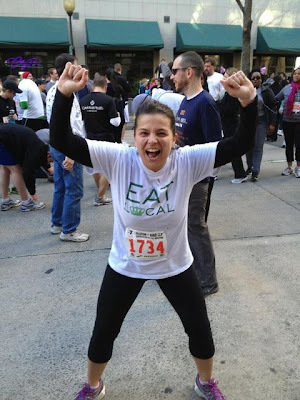 That was me the morning of my race after I completed my goal of running the entire time :) I was super pumped and I have to say I worried for zero reason (as is the case with most of my worries). The event was super charged with thousands of people, music blasting at 7:30 a.m., and in general, a fabulous way to start a Saturday morning. I'm signing up for another one in April - I might be hooked! On the Debbie Downer side, I think the run in the 30 degree slightly windy weather gave me a cold/allergy attack so now I'm under the weather and can't run without wheezing. It looks like I'll be taking a few days off from pounding the pavement, which believe it or not makes me sad. Who am I? Way to go, Jackie! Congrats on the running! Also, to increase your list of Irish movies, i recommend the Matchmaker. In it, you learn that Janine Garafalo can fall in love and not all Irish men can sing. I love the garland, super cute and quick! The key to longer faster runs, are to just keep running :) I know, obviously. But once you get past the 2-3mile mark, it somehow gets easier! Good luck! The qualities that you should look for while selecting sink cabinets and vanities are dovetail-locked seam connections, solid wooden frame, tenon joints and mortise.